Apologies for the super long break since my last blog post, but work has been keeping me busy (The joys of being an NQT!). Anyway, I decided to make the most of the bank holiday weekend and spent most of Saturday walking around London, from Holborn to Covent Garden and then onto Oxford Street. While I was enjoying the sunny Spring weather, I couldn't resist picking up a few things and even managed to cross two items off my wishlist. 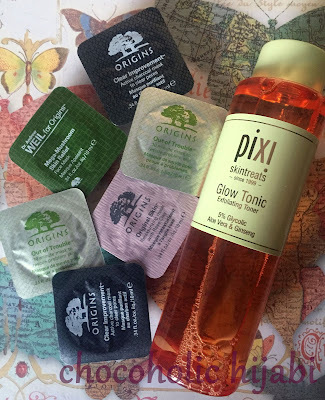 I've taken more of an interest in skincare over the past few weeks and finally managed to buy the Pixi Glow Tonic, an exfoliating acid toner which helps remove dead skin cells without any of the scrubbing. I also came across the range of Origins Mask Pods, which were on offer in Selfridges (6 for £12, one retails for £2.50), and chose a few different ones to try out. I do like the idea of the mask pods as they allow you to try the mask without committing to a full size product, which helps when saving money. 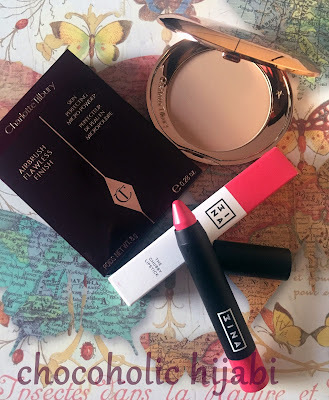 I also purchased two makeup products, the Charlotte Tilbury Skin Perfecting Micro Powder in medium (on my wish list) and the Chubby Lipstick in shade 103 from new brand 3INA (which has a store in Covent Garden). I haven't been makeup shopping in quite a while, but I don't think my makeup collection needs to grow anymore. Hopefully I'll be sharing what I think of the products in a few review posts soon, although I'm not exactly sure when that'll be!